Help your homeschooler advance to college-prep writing skills! This clearly explained course requires little work for the homeschooling parent and NO busywork for the homeschooler. Instead, each of the daily, simple lessons can be completed with little or no input from mom and gives the student lots of opportunities to find success in a self-directed manner. Click here to view an excerpt from Advanced Guide to High School Writing. Give your homeschoolers the tools they need for some great poetry writing. 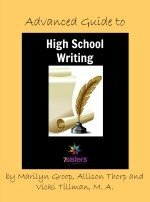 Release that powerful communication in your teen with 7Sisters high school short story writing curriculum. Homeschoolers can enjoy a powerful creative experience by writing a short story in the myth-fantasy format (the genre of The Chronicles of Narnia by C.S. Lewis and The Hobbit by J.R.R. Tolkien). By following the myth-fantasy “formula” familiar to the story tellers of ancient times and modern writers like Lewis, teens will sharpen their creative skills while thinking about friendships, different kinds of people, and ideas worth fighting for (like their faith). Week 1: What is Myth-Fantasy? Click here to view an excerpt from Advanced Guide to Short Story Writing. Give your homeschooling high schooler the creative tools he/she needs for more meaningful communication!